Are you wondering about the real costs of home warranties? As many home warranty companies try to conceal the costs of their plans and provide clients with perplexing information, we thought that creating a detailed comparison of all home warranty costs and fees (including service fees) would come in handy. Below you can view our findings on how much does a home warranty cost, and how to choose the best home warranty plan for your needs without overpaying. Home warranties are a popular option for home buyers due to their convenience, coverage, and the peace of mind they offer. Few, however, are aware of what they actually cost. Our comprehensive survey of over 14,000 plans and plan variations found that the average cost of a home warranty plan is approximately $600 per year. As the graph indicates, however, this can vary a great deal. This report summarizes several important factors listed in the figure above affecting the cost of home warranty plans. At ReviewHomeWarranties, we compare and review home warranty companies and their offering. Before answering the obvious question of “how much does a home warranty cost,” it’s important to understand what a home warranty is – and what it isn’t. Home warranties are coverage plans that cover common repairs in and around the home. Examples include major appliance failures, pool maintenance, and air conditioning. A good home warranty, even at the basic level, will include many options for common scenarios. Even still, there are almost always add-ons for different homes, homeowners, and risk tolerances. Pool coverage is one such example. If you don’t have a pool, however, there’s no reason to buy that option. Importantly, many homeowners choose a home warranty plan for the intangible benefit that comes with peace of mind. Knowing that repairs on major, common items are already covered and just a call away can ease the stress of home ownership. Now that the basics are out of the way, you might be wondering: how much do home warranties usually cost? After all, a product is only as useful as it is financially accessible to the consumer. To determine the average cost of home warranty plans, we surveyed a massive sample of 14,053 different plans and plan variations. Out of that data, we determined that the typical home warranty cost the consumer about $600 per year. That’s the short answer. However, as, the average cost of home warranty insurance can range from less than $49 to over $2400. In order to explain such a large range of costs, this study considered several variables affecting the cost of home warranty plans. The vast range of cost options is not coincidental. Numerous factors affect price, such as geography, plan type, deductible, term, and the particulars of the house being warrantied. Below we will describe how each factor affects the home warranty cost. 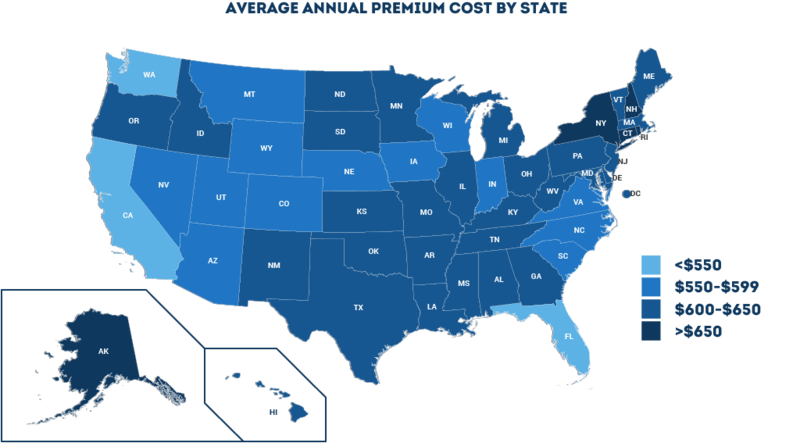 As the figure shows, California, Washington, and Florida have the lowest average home warranty cost. Washington’s is the lowest, at an average of $500 annually. On the other hand, the highest premium is found in New York, New Hampshire, Connecticut, Rhode Island, and Alaska. Alaska’s average home warranty cost is the highest at $706. Location does not always affect cost. Some companies offer the same price for every state they work in, whereas others vary price depending upon the specific state and even city. Most companies do not work in all 50 states for both legal and business reasons. Breaking it down further, the figure above shows minimum, maximum, and the average cost of home warranty plans. It breaks the ranges down by the three least and three most expensive states. There are numerous options in every state, though the most expensive states have a higher entry point of around $400 for the cheapest plan, while the least expensive states allow the consumer in for as little as $249. The upper end of the price range is also higher in the most expensive states. A state like Florida is cheaper because less can go wrong. The power grid is the most reliable in the nation. Temperatures almost never go below freezing. All in all, hurricanes aside, houses are in better condition and have fewer potential issues. So why might a state like Connecticut, or Alaska, be more expensive? It comes down to the cost of providing the home warranty itself. In Connecticut, the age of the median house dates to 1964. In Alaska, temperatures hover below freezing much of the time, creating more potential issues to be covered. As the figure above shows, the number of home warranty providers working in each state also varies a great deal. Both the least and most expensive states, Washington and Alaska respectively, have among the fewest number of different companies providing coverage. New York also lags in the number of options provided. Texas and Arizona, meanwhile, have the greatest number of options. Although this data may not have bearing on the average home warranty cost, it certainly affects how many choices the consumer has to choose from. Geography aside, the plans themselves offer numerous options for consumers to choose from. Even within the same home warranty company, there are a plethora of choices. The home warranty cost average will thus vary depending upon which plan the consumer chooses. For this cost comparison, we categorized home warranty plans by type as there is no naming convention for them. 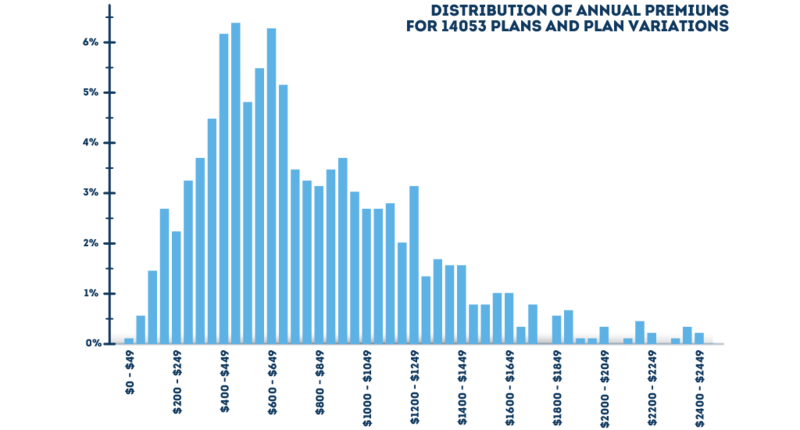 In the figure above, the types of plans are compared for the average cost. The graph bears out the fact that the typical home warranty cost will depend largely upon the plan the consumer chooses. For instance, home appliance insurance cost is the lowest, with an average of only $456. This plan, sometimes called an “Appliance Service Plan,” or a “Kitchen-Laundry Plan” only covers home appliances. That explains why the appliance insurance cost is the least. 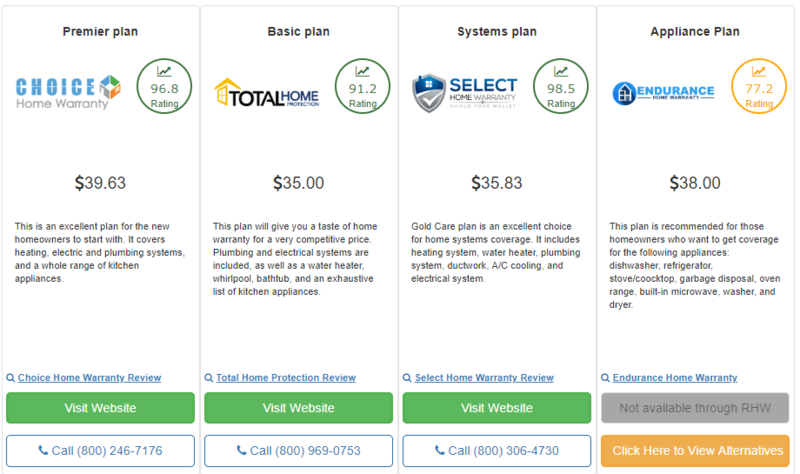 A systems plan, covering such items as air conditioning, plumbing, electric, and heating will cost a bit more at $472. This is sometimes called the “X, Y, Z” plan, wherein X, Y, and Z are the names of the systems being covered. When looking at major home warranty companies, combination plans are usually on offer. Most combo plans have levels of coverage, such as Basic and Total, or Silver, Gold, and Platinum. The highest levels deliver the greatest amount of coverage. Combination plans begin to rise in price, with the average Silver level plan coming it at an average cost of $502. Gold costs a bit more, averaging $615. The Platinum plan carries the most expensive home warranty cost average, at $733 per year. Obviously, the cost of the better home warranty coverage will be higher. Another plan variable affecting cost is whether companies offer annual or monthly payment. Home warranty plans have different terms from 1 month to 10 years. Shorter plans are often offered to existing homeowners, whereas longer plans come with new construction homes. The home buyers warranty cost comparison in this figure compares plans depending upon monthly or annual payment, with a further breakdown to consider different lengths of terms. What is clear from the comparison is that the home warranty monthly cost differs greatly from those offering annual payment. On average, the annual payment is $30 less expensive than a monthly payment plan. In other words, the one year home warranty plan cost will be lower if paid in full versus monthly. However, when we looked at all data available, 1-month plans appeared to be cheaper on average than 12-month plans. Some companies offer a promotional period of 1 or 2 months of free coverage. Another important factor is the length of term. How much does a one year home warranty cost, for instance, versus a longer term? What about month to month? The data show that the over 2 year home warranty cost, averaging $205, is by far the least expensive. These plans are usually only offered for new construction homes. The 1 year home warranty cost, meanwhile, averages $641. Further, terms between 13 and 24 months are about the same, averaging $642. 1-month plans cost $567 per year, the lowest average cost of a 1 year home warranty by this metric. The figure above shows the averages by a home warranty deductible. As might be expected, the most expensive average is those plans requiring no deductible at all, with other plans requiring between $50 and $125 deductibles staying in a narrow range of $607 to $657. This makes sense when considering that home warranties are, after all, a type of insurance. As such, the home warranty insurance cost is affected by similar variables. Auto and health insurance plans with zero or low deductibles generally cost more, sometimes much more, than their higher-deductible counterparts. The home warranty yearly cost, likewise, is substantially impacted by how little the consumer wants to pay when calling for service under their warranty. When the consumer asks “how much does home warranty insurance cost,” they ought to consider how other types of insurance are priced, too. Much of this goes a long way to answering the initial question of “How much does a home warranty cost per year?” However, it is not the whole picture. Geography and plan variables are significant in calculating the average cost of house warranty plans, but the home itself plays a role, too. A home warranty is available for any type of housing, from a trailer to a mansion, regardless of its age. However, living in an old dwelling will obviously cost much more than a new home. Indeed, the figure above illustrates a great gulf between the average cost of a home warranty for a new home versus one that was previously built. The typical cost of a home warranty is $303 less per year for new construction than for previously built homes. While many consumers will opt for home warranties to protect their investment regardless of house age, the research clearly shows that home warranties are much easier to buy when homes are new. In fact, a home warranty can be pre-purchased for a new home effective the day of move-in. For older homes, home warranties can be used as incentives by realtors or existing owners to encourage the purchaser. The consumer would be wise to closely examine whether such incentives would be available for the purchase of an older home if making such a decision. The other variable studied in relation to how the home affects the home warranty cost average is in relation to the type of home. The figure below examines the range of annual premiums available to those in various types of dwellings. The graph shows that condo home warranty cost is actually less than single family homes, with an average premium of $453 compared to $505 for a single family. The most expensive home warranties are reserved for duplexes, triplexes, and fourplexes – with fourplexes costing an average of $1228. Of note, however, is that these habitations are often shared by more than one family, meaning that the cost may be split to some extent. Square footage also plays a role in the average premium cost, with smaller dwellings under 5000 square feet costing, on average, $686 annually. Larger dwellings over 5000 square feet, by contrast, average $1116 per year. Home warranties are available for all kinds of residences, and the research shows that many companies will price differently depending upon such particulars. Broadly speaking, however, the home you live in ought to be considered, both for age and type, as an important factor in determining the cost. One of the components of having a home warranty is the purchase process. Our study considered the difficulty of the purchase process, measured by the number of questions asked by the company, as related to the average cost of a home warranty. Quotes were requested from all 34 companies in the survey to gauge the difficulty of the process. Some gave an instant “one size fits all” quote. Others asked for more detail, such as the type of the house, square footage and age, and offered different options for different prices. As the figure above shows, the more questions and details the home warranty company asks for, the more expensive the annual premium will be. A company asking zero or just one question will cost, on average, $480 per year. However, a company asking 4 or more questions will have a much higher premium of $725 per year. Consumers should be aware that the purchase process itself says a great deal about home warranty companies and the kinds of products they offer. Perhaps the home warranty cost to a seller is higher if the vetting process is more intensive. When asking how much is home warranty cost, the consumer should be aware what is being asked of them, also. The detailed quotes of some companies, which purport to offer more options, seem to lag the flat-rate companies in providing the best price. This report summarizes various factors affecting the average cost of home warranty plans by examining over 14,000 plans and options available to American consumers. Ultimately, the typical house warranty cost is affected by multiple factors that include geography, the options of the plans themselves, and the type of dwelling being insured. When asking what the average house warranty costs and making a final decision, the research presented here ought to serve as an initial guide to wading through the numerous choices available.